I feel like a stranger feeling at home at the Brown Rice Organic Bistro. In many ways, BROB feels like a perfect expression of Berkeley, California gourmet ghetto. It's a small place, with no fancy décor, with an open-air patio that faces a busy street. It has 3 medium size tables, and two 'khan toke' (low round tables made of wood to hold a plethora of dishes). It's always filled with tourists who seemed like they just came back from a meditation or yoga class or from walking their dog. Of course, as good as the smoothie drinks are the focus here is still on the food. Written on the chalkboard is a notice, “Every dish is prepared from scratch by Master Chef Duang.” The menu selection is not large, but offers a wide variety of signature dishes, including tofu fou (crispy tofu topped with tangy green mango salad); fresh spring rolls with tamarind sauce; and eggplant hinlay curry (ginger-based curry full of eggplant, tofu and hearty mushrooms). Desserts include the very delicious sticky rice with mango and chocolate brownie. On my first visit, I had the crispy tofu topped with tangy green mango salad and GOD for a drink. I got hooked! The following morning I went back to the restaurant to satisfy my craving for mushroom omelet, but I was disappointed to find the restaurant closed for breakfast. Finding two motorcycles parked inside the restaurant open air patio, made me realize that I was in Chiang Mai indeed. I told SB, my fellow volunteer, about the restaurant. We went back for a drink later. I had the Gac juice while SB had mango smoothie. The Gac juice tasted not as good as SB’s mango smoothie, but I was happy to have drunk a juice that has 12x the amount of lycopene found in a serving of tomato juice. The next day, our program director, brought our group (a party of 7) for lunch. Our lunch lasted for hours considering that every dish was prepared by Chef Duang himself. The following weekend, I came back to BROB to have lunch with my newfound friends. It was 3:00pm. The regular waitress was not available to take our order. Chef Duang had to double as a chef and server. Needless to say, it was another long wait. SB ordered banana/pineapple smoothie and mee gati noodles. HJ ordered naked mango shake and Pad Thai and Tom Yam served in a coconut shell. SA ordered crispy tofu, and I ordered eggplant with tofu dish and blue-magic (made from blue pea flowers and lime juice). I saw how Chef Duang picked ‘blue peas’ from a plant at the restaurant. For my blue-magic, I assumed! After eating our meal, Chef Duang came to talk to us and put the dish on our table. He said, “Complementary! You are the first to try my new creation. It’s crispy rice with tamarind dipping sauce.” I realized then why I kept coming back here. It's very inexpensive for food of such high caliber. I usually spend $5.00 on an average for a meal that includes fresh squeezed juice or smoothie. 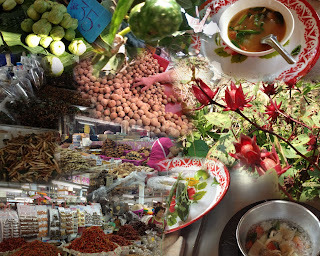 Having discovered the flavors of Northern Thailand by eating organic, vegetarian and gourmet foods, prepared by a master chef, through an organic bistro, put a smile on my face. I’m a foodie and not a vegetarian after all! 1. Taking a Thai cooking class was a great way to spend time with two of my fellow volunteers and to immerse ourselves in the local culture. 2. It was a great way to meet other travelers. We were taken out to the farm, about 45 minutes from the city of Chiang Mai. Along the way, our covered-truck picked up six more passengers from their respective hotels: a German couple, a young American tourist, two Expats taking a brother in-law to a cooking school. We had time to socialize while pounding our curry paste. 3. I didn’t have to worry about shopping for ingredients. We stopped at the Ruamchook market to learn about ingredients. Em, our cooking instructor, took us to a vendor who was making coconut milk. She explained the differences between coconut milk and coconut cream. We squeezed our way from aisle to aisle and saw stalls offering live fish, eels, snails and butcher blocks of freshly cut meats. Em showed us the stalls with different spices and seasonings. She explained the different seasonings. She said, “Fish sauce is one of the most important ingredients in Thai cooking.” She had a great sense of humor and had a few one-liners like “Do you know what they say about fish sauce? It smells like hell, but tastes like paradise.” While explaining about the complex cocktail of spices, the power went out. “Oh no, the meats will get spoiled!” I thought. Then it occurred to me there was no refrigeration used in the market for meat and seafood products in the first place. We had a few minutes to walk around and explore on our own. I turned a corner and found mounds of insects and maggots, dried squid and dried fish. Farther on there were stalls with cooked food: fried fish and sticky- rice. I saw some vendors grinding up some fresh papaya, banana and mango fruits. I found a coffee, cakes and pastry stall. My friend bought us cups of coffee that we consumed later inside a the moving truck. At the back of the market, I saw a cluster of stalls with beautifully stacked fruits. My eyes popped at how luscious and vibrant in color the vegetables and fruits of immense shapes and sizes were: papaya, banana, star fruit, durian, mangoes, mangosteen, rambutan, longkong. I bought a kilo of longkong and went to the corner to eat my fruit while waiting for the truck and the rest of the group. I peeled out the yellow skin of the fruit to reach the sweet translucent white meat. It had a tiny seed that was very bitter, but I learned how to eat around the seed to savor its sweet and flavorful unique taste. I ate and ate until I had mountains of the fruit skins surrounding me. When we arrived at the farm, we were ushered to a terrace above a fishpond. We were offered some cold water and tea. Each participant was given a red apron and a straw hat. We then toured the farm. Our instructor showed us a pandan plant (a plant with an aromatic and vanilla-like flavor); Kaffir plant for which the leaves and fruits are important ingredients to a Tom Yam recipe. All the ingredients needed for our recipes could be found in the vegetable garden: eggplant, lemon grass, galangal (my new obsession), chili, basil, cucumber, morning glory, beans, coriander, pumpkin, spring onion, ginger. There was an abundance of fruit trees like rose-apple, mango, gooseberry, jackfruit, banana, guava, star fruit, rambutan, lime, papaya and coconut. Unfortunately, we didn’t get to pick any fruits or vegetables for our recipe. We were given a checklist of recipes that we wanted to cook before arriving at the farm. I checked-off five dishes. Back at the terrace above the fishpond, we started our first lesson on how to make curry paste. I pound and pound and pound the ingredients that were already cut and prepared for us to make curry paste. 6. It was a great way to learn from a local. Our second lesson was a demonstration on cooking sticky rice using a typical Thai steamer. The sticky rice had been soaked in water overnight. She emphasized the importance of using the correct amount of water, and demonstrated the knuckle test. 7. I cooked, but I didn’t have to do the clean-up. Our lesson began in the kitchen with a demonstration by Em. She cooked stir-fry for her demonstration. I thought it made sense to cook stir-fry to show us some safety tips as well like ‘how to handle hot oil’. Each of us was assigned a burner. Everything we needed for our cooking was already cut and pre prepared and sitting at our station and ready to go. The clean-up was left in the hand of someone else. I wished Em told us from the onset that we would be eating all day. I should not have eaten all that longkong. After cooking our dish, we immediately plated and ate it at the terrace. 9. We were given a demonstration on how to pack a dish to-go. I took my Pad-Thai to my guesthouse. 10. We were given a recipe book to take home as souvenir.